Go anywhere, and take the entire family with you. Do not attempt to adjust your screen, be it a mobile phone, tablet, or big desktop monitor. Also, we apologise if, in the process of discovering this feature, you let slip an involuntary noise which garnered unwanted attention at work. We are duty-bound to present this sort of thing, because it’s not every day an automaker bolts massive tracks to plebian production vehicles. That is, unless the automaker is Nissan. This time around, the go-anywhere track upgrade comes from the North American market, more specifically Canada, for the Altima saloon, which is not sold in the UK. Part of that new package – and key to the track system on this one-off project – is the car’s all-wheel-drive system. There’s no way such a setup would make any sense with just the front treads turning, and if we’re honest, this is a pretty clever way for Nissan to promote its reinvigorated saloon. Plus, tracks are always brilliant. 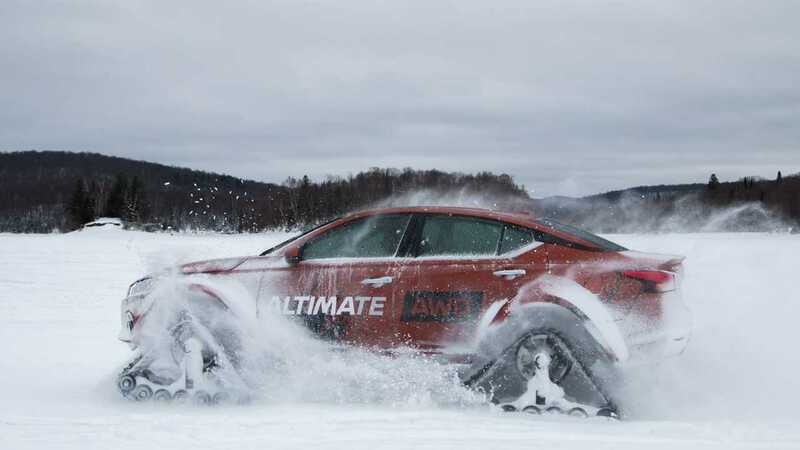 Turning the new AWD Altima into a snowmobile wasn’t simply a case of bolting on some tracks. Nissan says the special in-house project required significant fabrication work and took 250 hours to complete. The saloon’s fenders were cut up and flared outward by 18 centimetres to give the treads proper clearance, and also to lessen the amount of snow flung into the driver’s line-of-sight. The suspension was lifted 7.5 cm as well, but it wasn’t a straight lift. The extra space was achieved by actually dropping the front and rear subframes slightly, while raising the suspension components a couple inches. This was done so critical chassis components susceptible to wear wouldn’t be unduly shifted out of position. As for the tracks, they are from the Dominator track system at American Track Truck and measure a full 122 cm in length. Combined with a width of 38 cm, we suspect this is one saloon that has absolutely no problem tackling deep snow. The Altima-te AWD joins a veritable fleet of tracked Nissans, including the Rogue Warrior SUV and the mental 370Zki convertible roadster. Most recently, Nissan even fitted tracks to the Juke, which had its 15 minutes of fame just days ago at the 2019 Tokyo Auto Salon. The tracked Altima will strut its stuff in Canada at the upcoming Montreal Auto Show, which kicks off tomorrow. 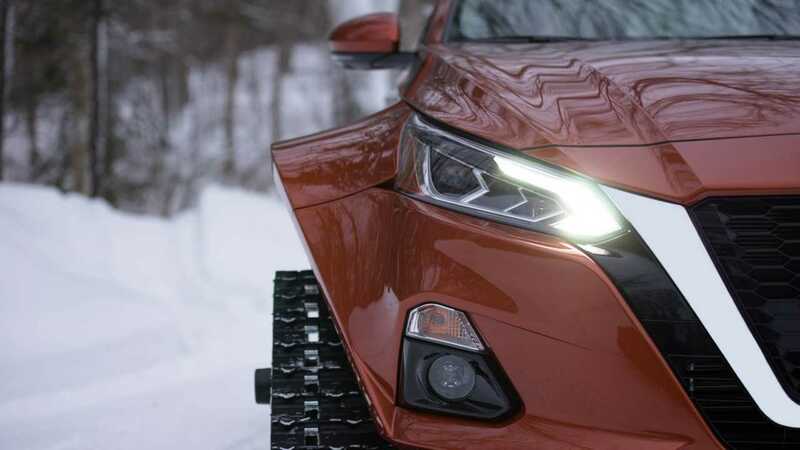 Montreal, Quebec – It's a sedan unlike anything Nissan has presented before - a project vehicle representing a new era of All-Wheel Drive (AWD) capability and an additional AWD choice for the Canadian customer. Named the "Altima-te AWD," this one-off project vehicle is based on the all-new 2019 Nissan Altima AWD, and continues Nissan's custom of creating aggressive, one-off models fitted with a heavy-duty track system. 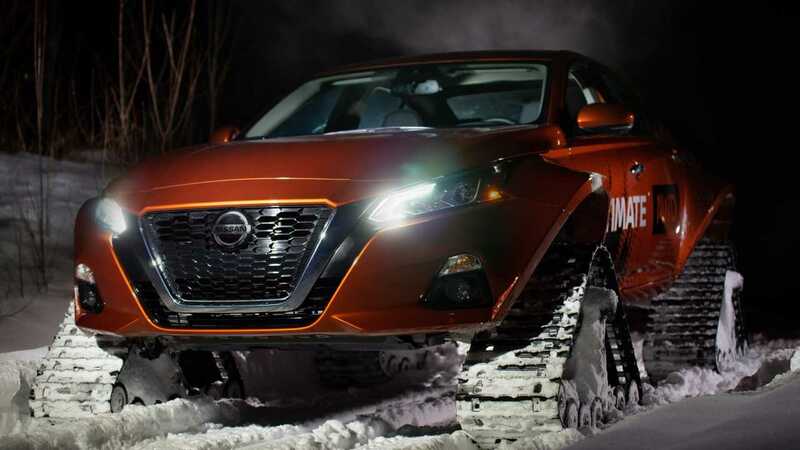 Like the Rogue Warrior which debuted at the 2016 Montreal International Auto Show (MIAS), the Altima-te AWD was modified entirely by Quebec-based Motorsports in Action (MIA), using the DOMINATOR® track system from American Track Truck. The tracks measure 1,220 millimetres/48 inches long, 750 millimetres/30 inches tall and 380 millimetres/15 inches wide. 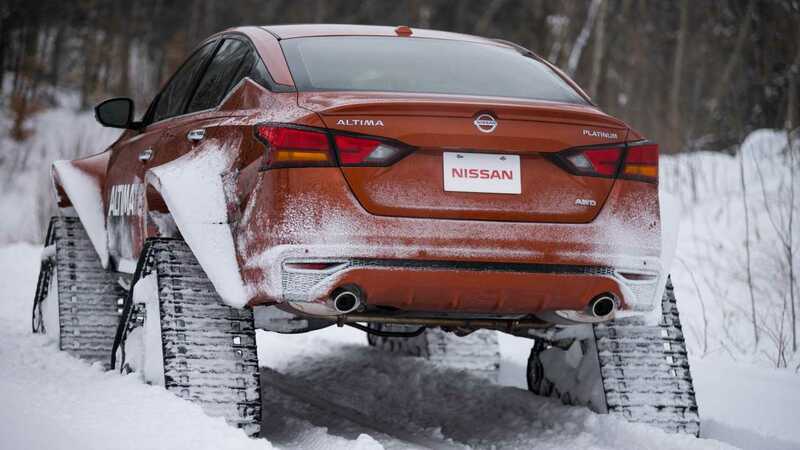 The Altima-te AWD required more extreme body and chassis modifications compared to the changes that were made on the Rogue Warrior project vehicle. The most prominent exterior modification to Altima's exterior is seen in the front and rear fenders that were flared out by 180 millimetres/7 inches on each side, to accommodate the DOMINATOR, track system, expanding the total body width by 360 millimetres/14 inches. This results in a noticeably assertive stance, while maintaining Altima's sedan design essence and flowing lines. To modify the fenders, the MIA team applied a complex process involving the design and fabrication of a bespoke wide body kit, and building the fender part using high-density foam and epoxy resin typically used in nautical structures. This process alone amounted to over 150 hours of work. The total project took 250 hours to complete. The extreme fender flares allow a reduction in snow projections, which could impede the driver's visibility. In order to make the Altimate-AWD fully functional, the vehicle's ride height required an increase. MIA designed and built the necessary components to raise the car by 80 millimetres/3 inches. To achieve this, the front and rear load-bearing chassis were dropped by 30 millimetres/1.18 inches and the suspension components were raised by 50 millimetres/1.96 inches. The suspension geometry was corrected to offset the deviation caused by the ride height change, and restore the proper kinematics. The Altima-te AWD will be on display at the 2019 MIAS for public days, and move on to be displayed in the Nissan booth at the Canadian International Auto Show in Toronto in February.